The Heights is located in northwest-central Houston. Unofficially speaking, the boundaries are Washington Ave. on the south, IH 45 on the east, Shepherd/Durham on the west, and the North 610 Loop on the north. The Heights is Houston's oldest planned community (circa 1890) Originally a very small area, it was annexed to the City of Houston in 1918. Unofficially, the Heights now includes the Woodland Heights, Norhill Heights, Sunset Heights, and surrounding tiny subdivisions that have all grown together into one diverse and funky area. In addition to some of Houston's best restaurants, it's also home to the Heights Hike and Bike Trail and several kid-friendly parks. Thanks to a recent boom, nightlife in the Heights is among the finer in the city. The humble yet cool vibe of Big Star Bar (1005 W. 19th) has earned it a near cult-like following in just a few months. Jimmie’s Ice House (2803 White Oak) offers up your prototypical neighborhood bar experience. Other noteworthy venues include the funky Onion Creek (3106 White Oak), the down-to-earth Pearl Bar (4216 Washington), and Porch Swing Pub (69 Heights). Many best-of-the-best call the Heights home. Crowned so by a local alternative arts and entertainment magazine and by the somewhat stuffier and more mainstream Houston Business Journal, the Heights’ Hickory Hollow (101 Heights) boasts the best chicken-fried steak, best new restaurant in Houston in the form of Glass Wall (933 Studewood), best tacos and homemade salsas at Berryhill (702 E. 11th), best plants, and best late-night restaurant. With names like Eclectic Home (home furnishings, 345 W. 19th), Glass Wall Restaurant (933 Studewood), Jubilee (women’s clothing, home décor, 321-A W.
19th), Redbud Gallery (art gallery, 303 E. 11th) and Antidote Coffee (729 Studewood), visitors can expect something for every taste. 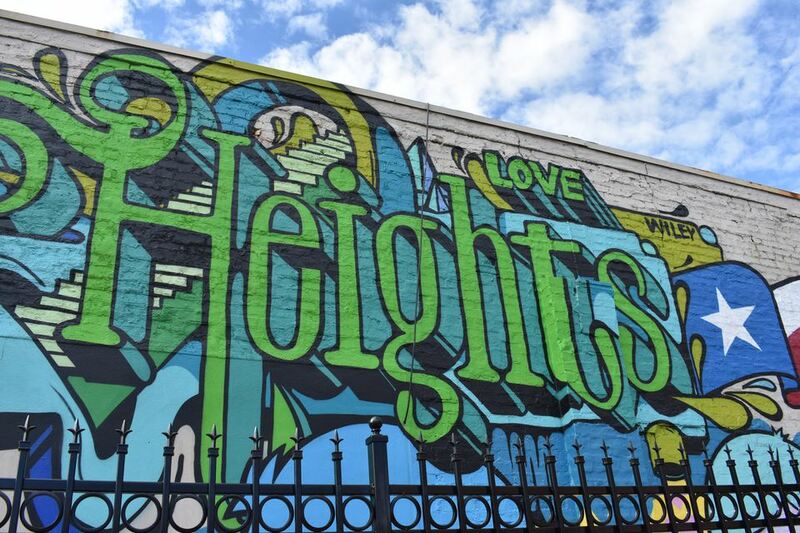 Originally a brainchild of a small band of visionary and dedicated small-business owners, Heights 1st Saturday brings visitors to the neighborhood to discover the Heights’ best-kept secrets. Eclectic boutiques, antiques shops, and the First Saturday Arts Market open their doors, plan special events, and have a grand ol' time. Artists show and sell their work, musicians play outdoors, and free shuttles carry visitors from business to business, providing some historical-and-otherwise insights into the culturally diverse and casual neighborhood. Billed by the organizers as “sultry, steamy, exotic, and artfully provocative,” White Linen Night in the Heights brings out an estimated 20,000 to 30,000 people. Always the first Saturday evening in August, art lovers wear white linen and take to the Heights streets. The event, a celebration of art, culture, and community, offers complimentary cooling summer drinks and recipes, entertainment, boutiques and shops, art galleries, fresh hand-rolled cigars, some of the best restaurants in Houston, and eclectic bars. Free white pedi-cabs, motorized rickshaws, and shuttles are the primary modes of transportation. Always the first Saturday in December, Mistletoe Madness is a similar event to White Linen Night but is earlier in the day to encourage holiday shopping. It includes a popular caroling contest, horse-drawn carriages, hot cups of Wassail, hay rides, and lots of holiday cheer. Free shuttles and pedi-cabs carry visitors around the neighborhood. Held on the second Saturday of December, this annual holiday event is signified by the block upon block of luminarias (candles burning in sand inside small paper bags), horse-drawn carriages, carolers, holiday parties, porch entertainment and strolling visitors. Due to the date of its inception, the area still has many original Victorian homes and classic Craftsman Bungalows. Some new construction, on the other hand, reflects the diversity of the residents and is as modern as you’ll find anywhere. Warehouses, derelict gas stations, and old grocery stores become homes, cafes, restaurants, and bars, while steel-frame metal-clad residencies sit between 1920’s constructions. The Heights also has an impressive set of walking/biking trails, including the Heights Hike and Bike Trail, the White Oak Bayou Greenway Trail and the Heights Boulevard jogging trail. The Heights are served by the Houston Independent School District. Elementary schools include Crockett, Field, Harvard, Helms Community Learning Center, Love, Sinclair, and Travis. Secondary schools include Hamilton and Hogg. Reagan High is the lone high school. There are two charter schools in the Heights: Houston Heights Learning Academy and Houston Heights High School. The New School in the Heights, on the other hand, is a K-9 private school, while the Houston Outdoor Learning Academy is a grade 6-12 private school. Reader Karen Mann contributed to the writing of this profile. Mann is an active member of the Heights Community and 24-year resident of the Woodland Heights. She lives, works and plays in the Heights and helps put on many of the events, including the 8-year-old Heights 1st Saturday, White Linen Night, and Heights Mistletoe Madness.